with me as the guest will be telecast tomorrow on Jaya TV. It was quite a demonstration of most of the songs that I have sung and also there was this point in the show when Mano sir asked what is it that I wanted to share about my life. I also finally got to say what I really felt about Rahman sir and how that opportunity was to me. Rahman sir, at the time when he gave me Kannathil Muthamittaal showed us the beacon of hope, like a farishta, lit a path when there was only mai iruttu around. So many times I have spoken of my mother. So many times have I been criticized, called names by comments in this very blog by anonymous dumb-behinders who so easily type whatever comes to their minds. Time and again am I reminded of what Sri Bhimsen Joshi said a couple of decades ago on this Marathi show called Chehra Aani Mukhavata (In Marathi, means the face and the profile. FYI - I grew up in Mumbai, my early childhood was spent there and at that point in time I could speak no other language other than Marathi and some Hindi. Of course a lot of people told me that I should have publicized this, jocularly, so that I could have become more popular ... hehe. I also wonder how my grandmother understood me. She spoke no English/Marathi/Hindi. Only Tamizh...well that's for a different post) wherein, he said if someone had to walk the path that he had, gone through the experiences that he had, the jagged stones and thorns that were laid out to him, then no one would ever want to be him and even remotely wish to live his life. And the very same way if someone had to have gone through what my mother had or what sometimes, I got a glimpse of while peeping through the shield that she had become, once in a while, I am not sure if I could have withstood all that. Some day and perhaps some day soon, I shall write about the life of this lady who had the gumption. This lady who is my mother. Very few people I know have that gumption. About the people she met. About the people she met, no thanks to my career and the blows she had to take. Yes, time and again and again, I would ask, if I were given one wish, I would change the 18 years of struggle my mother went through. I would change her life. Because like one of the music directors I worked with said, the only way that someone can disturb you is when they can hit out at your family member. Especially the one they think are closest to you. Are most important to you. So here is my word out to you. When someone makes a family member of yours a target, remember the actual target is you. Not them. And if you have a talented child in your family and you want to take them to glory (parent/sibling/anyone else) - remember the world is not out there to spread the red carpet out for you. And if you are plain-speaking and the no-nonsense type, it is going to be tougher. We have walked out of a lot of places which no longer walked their talk. At the end of the day, like my mother says I stand in front of God with a clear conscience. I can still sleep well (That is, if I am not too excited to sleep that is.. :)) I can look anyone in the eye, honestly and challenge them for what is righteous. Even if God had to stand in front of me, I can fight with him. That is if I want to fight. A lot of us read that nice guys finish last. Maybe. Maybe not. But that is a life that is worth living. To everyone who is fighting a battle, keep the faith. Like Rahman sir showed us the light, there will be someone for you too. Keep the faith and may God bless you. A person is not just a body and mind, but all the experiences they carry with them. Coming in up in life and being very successful at a young age is extremely hard. I admire your mother's perseverance, determination and hard work she has put in for you. Hats off to your mother. You should be very proud of yourself for making the best of her efforts. Kudos to both of you. Nice post. Every word of it is true. Wishing you a happy life ahead.
" We have walked out of a lot of places which no longer walked their talk. At the end of the day, like my mother says I stand in front of God with a clear conscience. I can still sleep well (That is, if I am not too excited to sleep that is.. :)) I can look anyone in the eye, honestly and challenge them for what is righteous. Even if God had to stand in front of me, I can fight with him. That is if I want to fight. A lot of us read that nice guys finish last. Maybe. Maybe not. But that is a life that is worth living. " For this especially, Chinmayee, take a bow :). Very well written chinmayi. Unfortunately once a person becomes a celebrity they automatically becomes a public figure and that means prying eyes will be after them. I love that song-Oru daivam thantha- poove. :) Great job. Getting boosted when I read few blogs which are of philosophical importance like this. Not only your post like this which says ur struggles in life but also some others where you post actual philosophy. Highly inspiring....yes faith can move mountains - no doubt. But sometimes I wonder why God choses such a difficult path for some and laid with roses for the others...aren't we all God's children ? This brings me to the question - Chinmayee, do you believe in Karma? Great post. I like reading all your posts. They are just straight from the heart. Good going. I'll surely watch your program. Infact I saw the promos and then visited your website to see if you have posted anything new. God bless you and hope you give great music with the legend called Rahman sir. All the best and please keep up the good work. Immersed in your Durga on Ma Durga!!!! Looking forward to Part II! Thank you :) To everyone who was kind enough to comment. 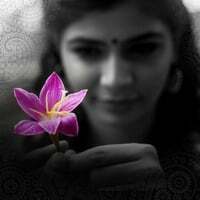 Hey Chinmayee, i just finished watching the first episode of yours with Mano. lovely voice and you rendered them so beautifully & effortlessly. God bless. all the best. btw, your sari was so lovely, where did you get it from? Wonderful post...been a very long time since i had read a post this inspiring. Please ignore those ANONYMOUS posts as those people are the ones who crave for attention and are basically LOSERS. God cannot be with us always, so he had sent "Mother" to always be with us. Your mother is a wonderful person. Had read your article/interview in Southscope where you had spoken about your mother and this post just shows how much love and respect you have for your mother. We are really thankful to your mother for giving us a wonderful person like you. God bless you and your family and hope you give us some spellbinding music in the years to come. Very nice to have watched your interview on Jaya today. In today's world where there is so much that is fake, it was refreshing to see something that was honest and from the heart. It was great to listen to you describe how your dream of singing for Rahman Sir came true, and even more that you weren't expecting much from it and felt fulfilled by the experience itself. I think that is key. Loved your Durga rendition and Maiya Maiya as always. Well i am not a blogger . . First time ever i have searched someones profile to give a comment . . watched the telecast on Jaya . . Well i don't have words to express my felling , It was really out of the world i watched it with my family and my mom really liked it . she was almost in tears listening to songs. . All the best Lady with your singing . What a wonderful performance on Manadhodu Mano!!! Simply Superb!!! A near perfection pretty close to SPB's live performance!! But I think you took the risks that even great ones would think twice to take on!! Only suggestion for improvement is to open the throw at high pitch rather than becoming a bit nasal. Nice interview!! Eager to watch part 2. Right said Chinmayi. I concur. I can proudly say that what I am today is coz of my mother. For all the hardships one goes thru in life, god definitely will show a better path and I believe in it. Just keep the faith and do what u think is right. Awrite! It's been a while since I commented. (Last time it was when you talked about Desserts :-). But now its "Manadhodu Mano". Boy O Boy. Donno where to start. Amazing rendition one after another. Luvd every moment. Was sad that the program ended so quickly. Can't wait for the next episode. Be cheerful as always and God Bless! PS: When do we start the next "Dessert" discussion? We (me and my better half) have discovered few more good ones around DC. Lets spread the wealth :D.
"To everyone who is fighting a battle, keep the faith. Like Rahman sir showed us the light, there will be someone for you too. Keep the faith and may God bless you." Chinmayi, thank you for sharing this. Also, we watched the show at home, and enjoyed it thoroughly :) congratulations! I am a huge fan of the way you write.. I like the Blogger in you more than the singer in you.. this happened after reading this post. I didn' t watch the show. I just saw a promo. And now am reading the post! Miracles are in us! And there are very few people who realize that and become the miracle themselves! Our entire family was glued to your renditions on Manadhodu Mano show. I told my family about your experiences that you have shared in this blog and they said that you are really talented and well brought-up. I might be almost your age and i feel that you have really used-up your time more than i did and that is why you are this great singer today. Kudos...Keep entertaining us. Waiting to watch the next part this week. Congrats!! for the recent awards..
Hi Sis, You prove that struggle leads to success.. keep going.. sky is not a limit.. God bless U.
Thats a great thought .. Very inspiring. Genuinely happy with your success girl !! Keep the great work flowing in..loved you as Jessie .. I have noticed you on couple of tele music reality shows. Some of the my favorite songs are sung by you and never realized that. I never took you very seriously, don't mistake me, i am not trying to be rude. that shows my ignorance. When i was casually talking to my wife, she told me that she follows your blog, and that drived me to here. I am very happy to have visited your blog and watched manadhodu mano. You simply rocked. You seems to me such a bubbly, cute, nice girl. I wish god bless you with lots and lots of happiness. Wonderful statements of truth! Chinmayee , I've always seen you as a someone with a great spirit of truth & determination. Moreover,it was one of my friend who actually let me know about your blog simply for the fact that there were way many things I could relate to ....esp. the mom & daughter bonding, singing, lingua skills,compering!I am really glad God's blessed you amazingly .... and may you be a source of inspiration to many a souls :) God Blez u dear !!! Off topic, I was hearing your VTV song, Uyirey, unnai unnai unnai. I felt you have sung that song with a strange "முக்கும் தொனி” in your voice. That made me to skip that song (despite its nice fast beat which resembles காதலெனும் தேர்வெழுதி in Kadhalar Dinam). Was that style of singing requested by ARR? Off topic 2, why do you write your blog with big paras and with just one line space between paras? It makes difficult reading. I think if you break your post into small two/ three sentence paras and give one extra line space between the paras, reading would be even more enjoyable. but tell me are you proud of yourself and do you feel you have done justice to your mother's efforts?.. I am a fan of Mano Sir. Can you mention 2 or 3 sentences about him? முழு நிகழ்ச்சியையும் பார்க்கும் வாய்ப்பு கிடைத்தது. உங்களுங்கு கர்நாடக சங்கீதமும் தெரியும் என்பதை அறிய முடிந்தது.அத்தோடு நீங்கள் ஹிந்துஸ்தானி சங்கீதத்தை அழகாய் பாடுவதனை முதன் முதலில் நான் கேட்கின்றேன் . விருது பெற்ற பாடல்களை தவிர ஒரு சில பாடல்களை நீங்கள்தான் பாடியுள்ளீகள் என்பதையும் அறிய ஆச்சர்யமாகவும் ,வியப்பாகவும்,மகிழ்ச்சியாகவும் இருந்தது. ‘And if you are plain-speaking and the no-nonsense type, it is going to be tougher.’- Got stuck here coz I’m one such kind. Might hold good for the media life than elsewhere I presume. And if this cut-throat world expects this, is it good to mask oneself with the requirement or to retain the natural stuff? really good post, thank you :) ive been a "plain-speaking, no-nonsense type" all my life, n it has been very tough indeed.. I know im intelectually gifted but I've not been able to perform to my potential .. reading this post was inspiring! i already loved ur singing n now i ve grown to admire ur writing style too.. I'm not a major music listener(I wish I was! ), so I can't claim to be a fan. I just like reading your blog for the heartfelt writing. This piece was especially moving. I'm currently battling a domestic violence crisis in my family, and have had to fight a lot of people simply because I want to do what's right. Only now do I realise how hard it is and how much it takes out of you. Your post makes me feel good and hopeful. More power to your mother and to you. Take care. You and your mother are the only ones who know how much you would have struggled and am glad that today you are what YOU TRULY ARE. Great that you have fought with all the struggles you had in your life and good luck for everything that you do in your life. btw: Immersed in your MAA DURGA rendition. Touché! I loved watching your interview...you are so inspiring for the next generation of youngsters! It was so touching to hear you talk about ARR Sir! Keep up all the amazing stuff that you do! My friend is an avid reader of yur blog and she was showing me this particular post of yurs. Your childhood seems really familiar to mine. My mum is an Indian married to a Singaporean, she was ill treated in a foreign land where she knew no one. With great gumption and resilience, she fought for her two kids and raised us as a single mother. Kudos to yur mum too, cos I see my mother in her. We are truly truly blessed with the best mum, please say my hi her. Mothers like ours are god's gift. Hi Chinmayi, I landed here blog hopping and I'm so glad that I did. I have been reading your blog posts (at random) for the past hour or so and you keep amazing me post after post. This one especially brought me into tears because I too was raised by my widowed mother and can relate with you to some extent because I can understand from a couple of other posts that you and your mother have gone through more than I can even imagine. I'm so happy that all your hardships have been rewarded finally. I sincerely wish even better things for you and your mom. I live in Toronto, Canada. I wish I had read your blogs back when you visited here. I would have definitely made it to the concert. There is always the next time and hope to meet you during your next visit. All the very best. You keep going girl!